Updated 9 March 2019. Current offers first on this page. Further down on this page you will find information about identifying Skowroneck harpsichords, and about beryllium-copper strings (some updated info July 2018). This page is about the keyboard instruments made by Martin Skowroneck, who was a harpsichord maker and my father. Skowroneck made 89 (-and-a-half, see below) harpsichords, three fortepianos and a great number of spinets, virginals and clavichords between the mid-nineteen-fifties and 2013. These instruments were all hand-made to the very highest standards, and I have a personal interest in that they are kept in a good state and end up in good hands. I therefore offer the non-profit service of bringing sellers and buyers of used Skowroneck harpsichords together. 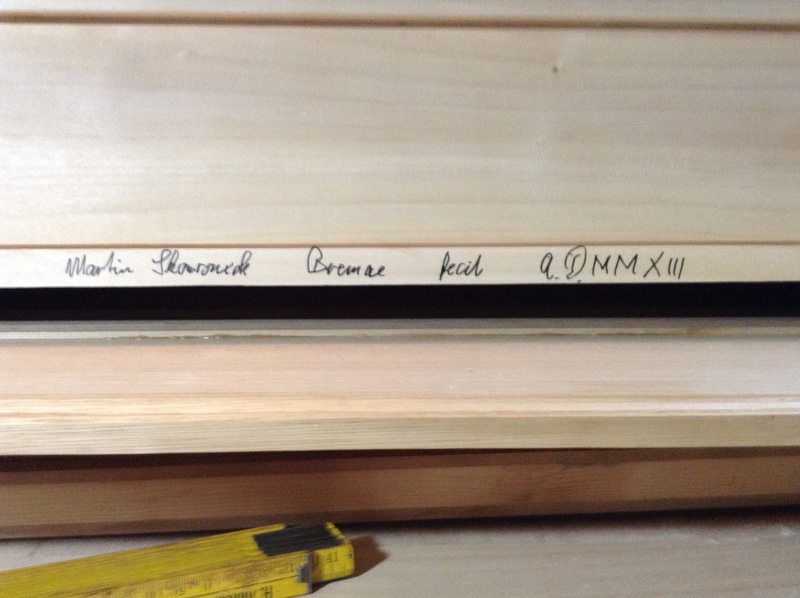 * Do you own a harpsichord made by Martin Skowroneck and want to sell it? * are you interested in buying a used Skowroneck harpsichord? This is one of altogether four spinets in this style made by Martin Skowroneck. This instrument was his particular favorite and has always been in our family. Beryllium-copper strings (see also the text below on this page). Ivory-covered sharps. An official CITES document (for the ivory) does exist and is part of the purchase. – A two-manual harpsichord after Mietke, Martin Skowroneck no. 60 (1986). – A pentagonal virginal (keyboard range: C short octave – f3) with outer case. Martin Skowroneck 1965. – A fretted clavichord, C – g3, after Hubert. Martin Skowroneck 1966. Pictures below. Please contact me at tilman[at]skowroneck[dot]de (replace the “at” and “dot”), and I will get you in touch with the seller. 3) Original J. and A. Kirkman harpsichord 1775 (provenance: R. Russell—G. Leonhardt—M. Skowroneck) Boalch no. 57b. The instrument was last restored in 1978-9 by Martin Skowroneck and myself, but is at present in need of further restauration (some glue joints, stringing, general cleaning and regulation). This can either be arranged before the sale (adding approx. 6.000,- Euro to the price; to be restored by Uli Weymar in Hamburg), or the instrument can be purchased in its present, unrestored state. Sold to the highest bidder. More photos available upon request. 4) Reserved: Martin Skowroneck’s last harpsichord no. 90. Completed by Dietrich Hein (2019). This is a two-manual Franco-Flemish harpsichord with a keyboard compass FF-e”’ (and a transposing mechanism 415-440hz.). The instrument is now sounding and the first customer on our list will visit Dietrich’s workshop very soon for an assessment. Price approximately 45.000,- Euros. Martin Skowroneck abandoned working on this harpsichord during the fall of 2013, about halfway into making the keyboard frame. The soundboard was prepared much earlier than the rest of this instrument, representing the high standard of Skowroneck’s work of the 1980s; it was put aside for a variety of reasons but has turned out to be a great piece of craftsmanship, providing the instrument with a full and beautiful sound. Dietrich has done a marvellous job figuring out how to match the bridge pinning to the intended keyboard range and layout, calculating the scaling, and getting everything very neatly in place. 1) This modern material, which has a breaking point similar to brass, has one positive mechanical property similar to historical brass: it sets quickly instead of stretching endlessly. A replacement string will keep its pitch after only a few adjustments. 2) Other advantages include a relatively high resistance to breaking when bent, and a complete absence of the annoying tendency of modern brass to slip at the loops. 3) Contrary to occasionally voiced beliefs, beryllium copper is also not prone to material fatigue and deterioration during normal use in the appropriate sections of the instrument (that is, if the scaling and pitch are appropriate for this material). The sound stays largely the same for decades, and the tendency to break does not increase noticeably (unless a string is, of course, faulty from the start). 4) Beryllium copper of the kind best known to me also has a good sound. True, most people will have no possibility to make direct comparisons between the various materials – and “good” is a problematic term. I have tested both brass and beryllium copper in one single instrument and monitored their properties over a time span of 15 years. I found beryllium copper to sound slightly “fuller” than the brass that is usually available today, but without compromising the appropriate overall “brassy” sound character. Together with the advantages listed above I personally prefer this material (until one day perhaps some truly historically appropriate brass may become available for testing). As said above, however, these properties may vary from manufacturer to manufacturer and not all beryllium copper appears to be as good as I describe here. The reason for this lengthy explanation is that beryllium copper looks very much like phosphor bronze, and can easily be mistaken for it. Especially, it seems, my Dutch colleagues have (for over two generations now) developed a knee-jerk-disdain-reflex against “red” strings in harpsichords with a brass scaling; these will invariably be called (and sniffed-at) “phosphor bronze” after barely a glance. Now phosphor bronze strings are, as far as I can tell, indeed inferior to both brass and beryllium copper, so there are good reasons to be wary (also, the tensile strength of phosphor-bronze is different with the result that such strings mounted in a true brass-scaled harpsichord likely will be under-tensed, which does not benefit the sound quality). But the visual aspect alone is insufficient for a proper identification. In fact, not a single Skowroneck harpsichord was ever delivered with phosphor bronze strings. It would be a shame and a waste of good material to change the red strings found in a used Skowroneck harpsichord into new brass strings on the basis of such a misunderstanding.